I think this nail art might be the nail varnish equivalent of 'that' dress. Remember the one? The one that some people saw as blue and black and some white and gold, or something along those lines. My boyfriend spotted my nails and commented on what a nice blue it was and I told him it's actually green (and I'm pretty sure he's blue/green colour blind!). However, later when we were outside I looked down at my nails and they looked blue. They do look particularly blue in my photos, but my camera does like switching blues and greens around a bit. So I'm not entirely sure what colour this nail varnish is, but I'm going with a minty blue/green. This obviously isn't a particularly difficult design and doesn't really require much explanation. I've never really been a fan of green or blue nail varnish but recently I've found myself going for more and more green shades and I may even be coming round to certain blue shades. I decided to paint my nails with Ciate's Pepperminty after discovering that I loved the look of it on my nails and I thought it would look really nice with a crisp white shade. 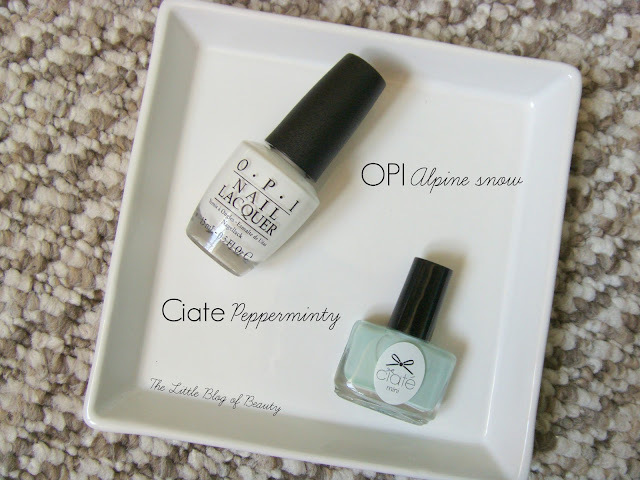 So I decided to go for an alternative French manicure and painted just the tips of each nail white (OPI Alpine snow) using tip guides to make a clean crisp line. Are you a fan of French manicures, traditional or alternative? Love this! The colours work so well together.